War Thunder Game Hub: Lets get airborne grunts! The great promise of War Thunder has always been that its fire-spitting aircraft and bomb-gobbing tanks would eventually join together in glorious phlegm-filled shooting matches. It’s been months since Ground Forces introduced tracked armour to the game - but it’s taken until this week’s update for tanks and planes to trade fire. Update 1.43’s arcade mode allows players to use aircraft to support ground forces. 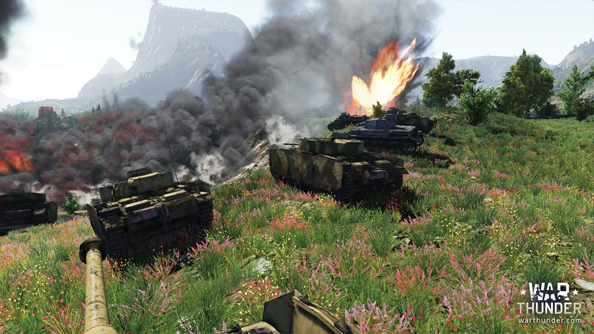 All players start the battle grounded, in tanks - but once they’ve destroyed two enemy machines, they’ll earn the right to whizz about in an attacker aircraft. If they then blow up three tanks from the air, they’ll unlock the right to a heavy bomber - best used to “smash enemy armoured units with their bomb payload”. Air-to-ground combat becomes an imperative during triggered ‘mini-events’. These are temporary shared objectives - to cause a huge amount of damage to particular enemy ground forces within a strict period of time. Tank players will call down these mini-events, and flying allies will cover their “devastating raids”. Opponents will do their best to intercept. This last bit’s important for would-be pilots: tanks don’t pop out of existence while you’re dogfighting - so Gaijin encourage players to find an appropriate hidey-hole for the duration of their flight. And don't blow up your own tank, OK boys and girls? BoS Free version does exist! Battle of Stalingrad Free 2 Play WT style?